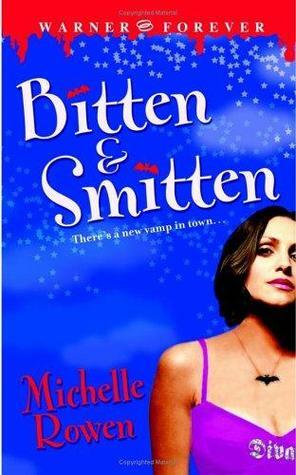 Bitten & Smitten starts with a familiar and amusing premise that I happen to enjoy - a quirky, sort of socially gawky girl meets tall, dark, and fangy and romantic hilarity ensues. Unfortunately in this particular book, the lead character, Sarah Dearly, is a wee bit too frustrating to be quirky and the hilarity fell flat. It starts with Sarah being buried in a graveyard by her blind date and goes downhill from there. I still have no idea why her erstwhile suitor had to bury her, as the other two turnings that happened in the book didn't seem to require graveyards, but as the erstwhile suitor ended up shish kabobbed shortly thereafter, and the rest of the story was laden with some unexplained stretches of intelligence, too, I'm not going to make that big a deal out of it. Unfortunately, the sequence of successive horrors that Sarah kept tripping into didn't serve to amuse me as much as I'd hoped, and a couple put a strain on my intellect. I was hoping for a light, engaging read that gave me a few chuckles, and I suppose I shouldn't be too disappointed, as two out of three isn't that bad, but given that the one that missed was the "engaging" part, I ended up feeling a little unsatisfied. I had a hard time warming up to Sarah, though admittedly, she did appear to have the right intentions for the most part, and by the time I did warm up to her, other things were going on that just annoyed me. I don't want to spoil anything, but come on, how long have vamps been around? And they can get together to socialize but haven't figured out that working together to fight against the threat of hunters just might be a bit more effective than the "walk around until you get staked" plan? Uh...right. And it takes the recently fired executive assistant to tell them that? How are they not extinct already?? I admit to having a prejudice against plot points that are outside the bounds of common sense because it does a serious number on my willing suspension of disbelief, and there were just too many things in Bitten & Smitten that pushed that button for me to be able to rate the book any higher. I'm not giving up on the series, because there were aspects of the story I did enjoy, but my patience won't last if the second book is of a similar vein...no pun intended.